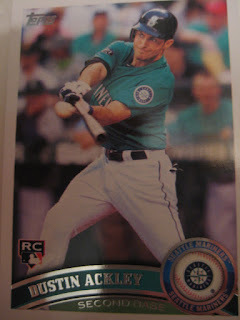 I have one card of Dustin Ackley, from 2011 Topps Update Set. Playing career: Second baseman Dustin Ackley made his major league debut for the Mariners in 2011, hitting .273 with 6 HR and 36 RBI. My memories: I remember hearing about him on the MLB Network before the season and heard about he was going to be such a big star. His first big league season was pretty pedestrian, however. Where he is now: Slated to be the Mariners regular second baseman in 2012. Google Autocomplete results: He is first when you type Dustin A, before Dustin Aksland, a photographer. There do not appear to be any other prominent Dustin Ackleys. Coming up next: The next profile will be Ryan Adams. I have one card of Victor Alvarez, from one 2003 Donruss Team Heroes. 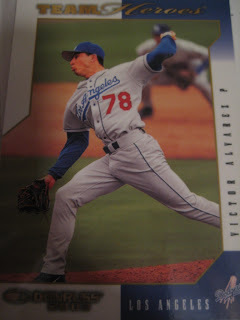 Playing career: Victor Alvarez pitched in nine games for the Dodgers in 2002 and 2003, going 0-2 with a 7.31 ERA. Where he is now: Pitching in the Mexican League. Google Autocomplete results: He is eighth when you type Victor A, between Victor Abiamiri, a defensive end for the Eagles, and Victor Airways, pre-determined routes flown by pilots under instrument flight rules. He is the third entry when you google Victor Alvarez. Other Victor Alvarezes include the Business Diversity Manager at the University of Chicago, the most recent Power Man, and a corporate law partner at White & Case, whose founding partner George Case invented the squeeze play. Coming up next: The next profile will be Alexi Amarista. 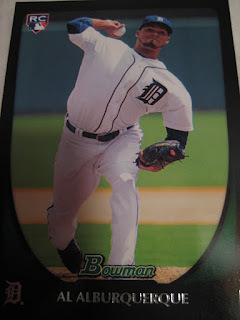 I have one card of Al Alburquerque, from 2011 Bowman. Playing career: Al Alburquerque made his big league debut for the Tigers in 2011, going 6-1 with a 1.87 ERA in 41 appearances. Where he is now: Will miss the first half of the 2012 season due to elbow surgery. Interesting stories: Alburquerque pitched twice for the Tigers in the ALDS against the Yankees. The day after his second appearance, a caller to NY radio station WFAN asked know-it-all host Mike Francesa about Alburquerque, and was dismissed by Francesa who thought the name was made up. Later, after being informed that there really was an Al Alburquerque, Francesca insisted he knew who the pitcher was but always knew him as Alberto Jose Alburquerque and not Al. You can read more about it and hear the clips here. My memories: When I first heard of him I thought that was a made-up name, too. I hope he has a great career – that is one of the all-time best baseball names. Incidentally, his last name is the traditional spelling – it is the New Mexico city that technically spells it wrong, dropping the first r.
Google Autocomplete results: He is fifth when you type Al A, between Al Anon NYC and Al Anon Meetings NJ, both of which refer to the alcoholism organization. There do not appear to be any other prominent Al Alburquerques. Jo-Jo Reyes or Mike Gonzales: Steve was right! Bill Ostermeyer on baseball cards.